Free cutting steels also known as free machining steels are those steels which form small chips when machined. This increases the machinability of the material by breaking the chips into small pieces, thus avoiding their entanglement in the machinery. This enables automatic run of the equipment without human interaction. Free cutting steels with lead also allow for higher machining rates. As a thumb rule, free cutting steel normally costs 15 % to 20 % more than the standard steel. However this is made up by increased machining speeds, larger cuts, and longer tool life. The cutting (machining) operation is shown in Fig 1. In turning, milling and drilling operations commonly known as machining operations, deformation/welding of the tool/work piece interface occurs rather than chip formation. During the machining operations surface finish is impaired, cutting temperature increased and tool life reduced significantly. A large ‘built-up edge’ is formed on the tool tip at very low sulfur contents. This requires frequent dressing or changing of tools, reduced productivity and higher costs. The term machinability is characterized by the following three parameters. Tool life of the cutting tools employed for machining operation. The term machinability relates to the ease and cost of achieving a production schedule for machined parts. It deals with consistent production of machined components which are able to satisfy product property specifications and in service performance requirements, at minimum through cost. Machinability can be measured in terms of surface finish, chip form, tool life, power consumption, and production rate. Machinability is not a unique material property like tensile strength, since it depends on the criterion selected, the type of cutting tool, cutting operation, cutting conditions and the machine tool power. The higher is the strength and hardness of steel, the higher is the cutting forces and temperature and lower is its machinability. Embrittling of steel however, improves its machinability, by facilitating the chip formation process and reducing the built-up-edge. There is however an optimum hardness for maximum machinability. At very low hardness levels (less than HV 100), steels are too soft and ductile and a large unstable built-up-edge is formed on the cutting edge. Consequently machinability is best in steels which are soft and brittle. Hence a compromise must be reached when attempting to maximize machinability since steels which are normally used are to be strong and tough. The objective of free cutting steels design is to increase the ease with which the metal can be removed by the cutting operations. However, enhancements in machining performance are often at the expense of mechanical properties. Free cutting steels are usually carbon steels which have sulphur (S), lead (Pb), bismuth (Bi), selenium (Se), tellurium (Te), or phosphorus (P) added to it. Presence of these elements imparts the properties necessary for free machining since it basically ensures easy dispersal of chips during machining, thereby reducing the machining force, and improving tool life and surface finish of the machined component. The cutting behaviour of carbon and alloy steels is influenced by chemical composition, microstructure, quantity and type of inclusions and work hardening rate. In normalized ferritic/pearlitic steels, increase of carbon content reduces tool life rapidly, with chip formation changing from a flow mechanism to a shear mechanism. However, for steels containing less than 0.15 % C, large built up edges of material may develop on the tool rake face, leading to unpredictable machining characteristics. Reduction in strain hardening rates can induce lower tool wear, shorter chip length and a superior surface finish, and this can be promoted by cold work or increases in P and nitrogen (N) levels. If the quantities of hard second phase (e.g. bainite) are present instead of pearlite, the region of shear in front of the tool top is restricted, leading to higher temperatures and lower feed forces. Quenched and tempered martensitic/bainitic structures exhibit inferior machining characteristics because of high hardness levels, although most medium carbon steels are machined in this condition. For a given matrix structure, one of the most popular methods of enhancing machining performance is to manipulate the nature and distribution of inclusions present with the steel. Inclusions can be broadly classified in terms of their influence on cutting behaviour as follows. 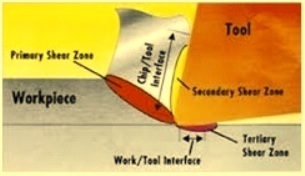 One of the most common techniques for improving machinability is to increase the S level. S forms the compound manganese sulphide (MnS) which is soft and acts as a chip breaking discontinuity. S increases the volume of deformable MnS inclusions. Typically the highest commercial S levels are around 0.35 % and sulphur is the cheapest machinability additive. Additions are beneficial in the following ways. Shearing work involved in chip formation is reduced. A strong lubricating effect occurs at the tool/chip interface. Protective sulphide deposits form on carbide tools over a wide range of cutting speeds. Built up edge stability is increased and size is reduced, resulting in improved surface finish. Machinability improves with increased sulfur content. Manganese sulfide inclusions act as internal crack initiation sites during the intense deformation and high temperatures that occur during chip formation in cutting operations and reduces the chip curl. They make the chips curl more and act as chip breakers. They also behave as an internal lubricant between the chip and the tool. This also reduces the built-up-edge formation. Hence, a high volume fraction of manganese sulfide inclusions in free cutting steel reduces the force required to create the chip. This reduces the friction between the chip and the tool, lowers the cutting temperature, reduces tool wear and improves the surface finish. The latter is impaired by a large unstable built-up-edge on the tool. With certain types of carbide cutting tool, a layer of manganese sulfide can build up on the rake face of the tool, acting as a protective barrier between the chip and the tool and further enhancing machinability. Machinability is optimized by a uniform distribution of large globular sulphides, whose distribution is strongly influenced by casting and deoxidation practices. Se and Te can substitute for sulphur to form mixes inclusions and their high S activities lead to lower surface energies at matrix/sulphide interfaces, thereby encouraging microvoid formation and cracking. Te may also reside as a thin film at inter phased boundaries, thereby reducing resistance to shear still further. Pb works in a similar way to Sulphur. Although the solubility of Pb in molten steel is around 0.3 %, it is virtually insoluble in the solid state and forms a random dispersion of inclusions in low S steels. In resulphurized grades, Pb additions also forms ‘tails’ on MnS inclusions. Pb acts as an internal lubricant, reducing friction, promoting chip embrittlement, improving chip form and surface finish. At high cutting temperatures leaded steel begins to begin to behave similarly to non leaded steel. Pb can actively promote the beneficial globularization of sulphides leading to enhanced machining performance. Addition beyond 0.35 % is not usually feasible due to segregation phenomenon. However co-introduction of upto 0.10 % Bi allows the total insoluble phase content to be increased further. If no Pb is present then Bi is normally present as tails to MnS inclusions and as a fine dispersion. Bi is added in places where lead usage is not favoured (or in extreme cases banned). It is also used as a supplement to lead. Bi achieves the free machining capability in steels by melting into a thin film of liquid for a fraction of a microsecond to lubricate the cut. Other advantages with Bi include uniform distribution because of its density being similar to iron, being more environmentally friendly as compared to lead, and still weldable. Other elements such as P and N also play a supplementary role in deciding the overall machining performance of free cutting steel. P and N not only increase the hardness of steels but they also embrittle steel. This increase in hardness is enough to achieve the optimum hardness. Therefore, they are also important constituents in low C free cutting steels.